The second floor of the Dunn house is cantilevered off a cliff face. It meets and extends past the lower floor. 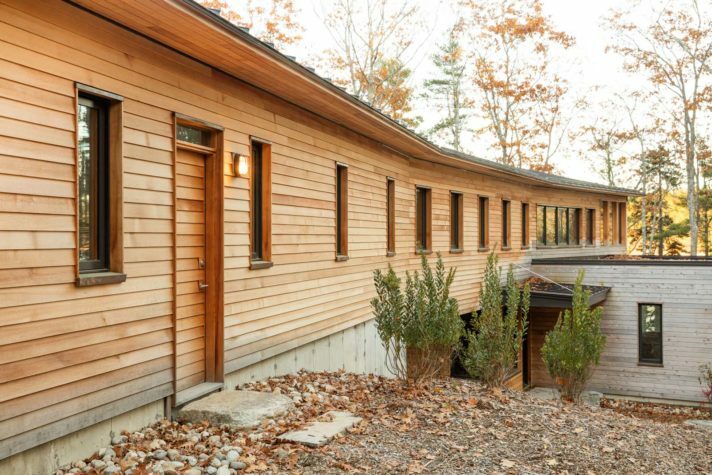 The sloping roof shown here supports solar panels and allows for a soaring space for a second-floor writing room (on the right) and a more intimate space for the sleeping porch (on the left). The ground floor has (from left to right) a screen porch, great room, and owners’ bedroom. Sally Bliumis-Dunn looks out her kitchen window to a tidal inlet. Hexagonal tiles are laid against the cork of the kitchen floor and the hickory of the living room floor in a pattern that suggests the advancing and retreating tide. The flat-panel cabinetry is accented with turquoise. The color was inspired by cabinets that Sally saw with her husband, John Dunn, in an apartment in Israel. The countertop is a highly polished slab of live-edge walnut. The painting is by William Crosby. 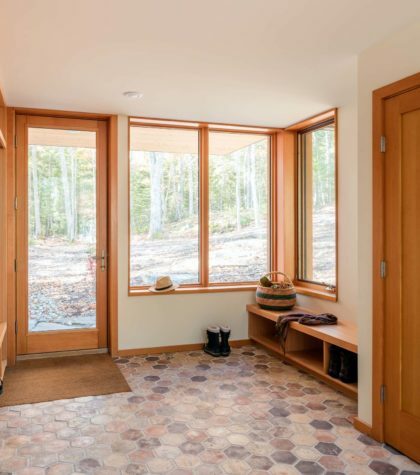 The front door opens into this mudroom with hexagonal tiles and Douglas fir built-ins. A soaking tub from Italy arrived without its drainage mechanism, creating a major installation challenge. The painting of a farmhouse is by Ingunn Milla Joergensen of Kennebunkport. The hexagonal tile was sourced in New York. Architect Jesse Thompson suggested using copper for the balusters, handrail, and accents of this Douglas fir stairway. The painting is by Holly Lombardo. 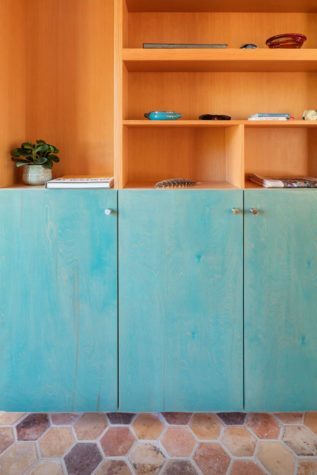 The wood grain shows through the turquoise stain on the flat-panel cabinetry in the mudroom. 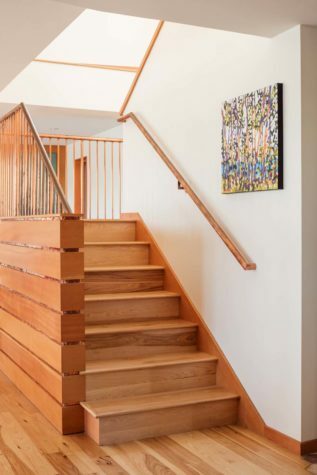 Copper strip detailing provides a contrast to the Douglas fir of the stairway wall. 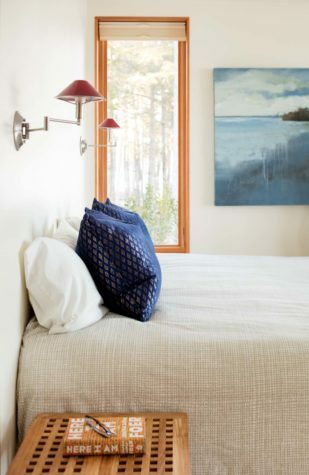 A bedroom features a painting by Allen Bunker. 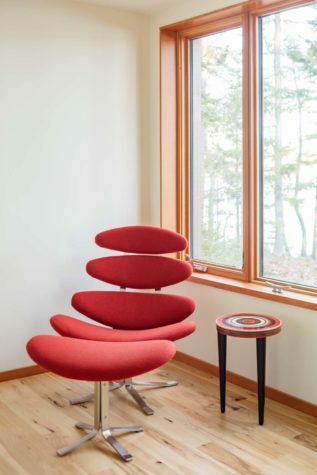 Sally’s mother had an Eames chair in her house in Florida, and the forms of this red chair with an oval back reminded Sally of that classic midcentury modern chair. It was purchased at a Lillian Vernon outlet. A table that goes to a vanishing point with benches on either side forms a diner’s booth for playing games. The table has a folding leg, which allows the surface to lower down to the benches to create a sleeping area. The painting above is also by Allen Bunker. 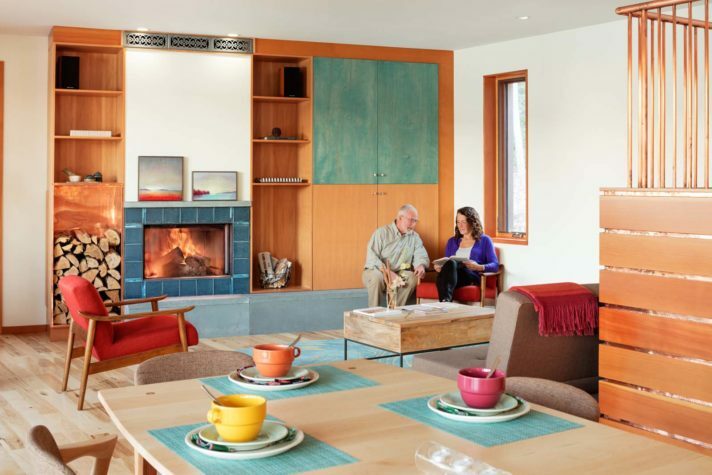 Vibrant colors and wood allow the home to be modern but warm. The coffee table is from West Elm and has a pop-up portion that forms a laptop desk. The dining room table with a maple top and cherry legs is based on a coffee table that the Dunns saw at Chilton Furniture. The company obliged them by making this larger version. The art on the mantel is by Julie Houck. A view of the long vertical second floor, with a door to the garage in the foreground. Builder Mike Dorsey dressed up the windows with copper sills and drip caps. Red cedar is laid as shingles on this floor and as shiplap down below. 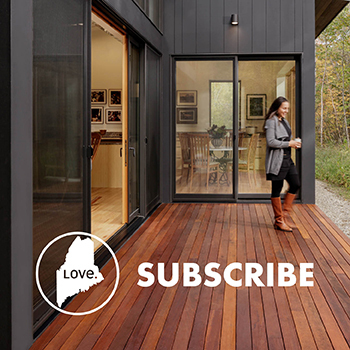 John seemed half-embarrassed as he sat with his wife, Sally, in Kaplan Thompson Architects’ office in Portland, talking about a piece of land that he and Sally had recently bought in Harpswell. “He had all these sketches with him,” says architect Jesse Thompson. “He had been thinking about their house a lot. He had an idea for a path to the water that would be up in the air.” Thompson was intrigued. The Dunns wanted their house to be contemporary and green— the very things Thompson’s firm specializes in—and they “were already thinking outside of the box,” says Thompson. To truly understand the path-to-the-water concept, Thompson needed to see the site. The Dunns work in New York—he as a psychotherapist, she as a poet and professor—so they were camping on the lot when Thompson made his first visit. It was raining. The two were soaked, but they greeted Thompson eager to describe their hopes. Their plot ran alongside a tidal inlet but was reached from a high point on an adjacent steep cliff. John’s idea was for the second story of the house to fly out from the cliff until it joined the first floor below. The idea remains hard to visualize, unless you think of a T lying flat, with the vertical line as the second floor cantilevered out from the cliff until it meets the horizontal line of the first floor below. The ground floor is simple: mudroom, living room/ dining room/kitchen space, owners’ bedroom, and screened porch. The porch was included because mosquitoes were abundant the summer the Dunns first camped on their land; however, since then the bugs have been relatively absent. Windows or glass doors line the water-facing walls. From the outside, one truly senses Thompson’s goal to have the lower level of the home stretch along the banks of the water, embracing the length of the site. The cantilever T wasn’t the only idea the Dunns brought to the table. 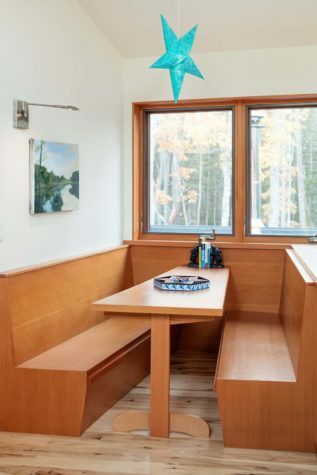 John wanted the second-floor hall to have a Douglas fir diner’s booth for, as Sally puts it, “the grandchildren we don’t yet have to play Scrabble.” And both the Dunns wanted minimalist, contemporary forms with warmth, color, and some surprises. 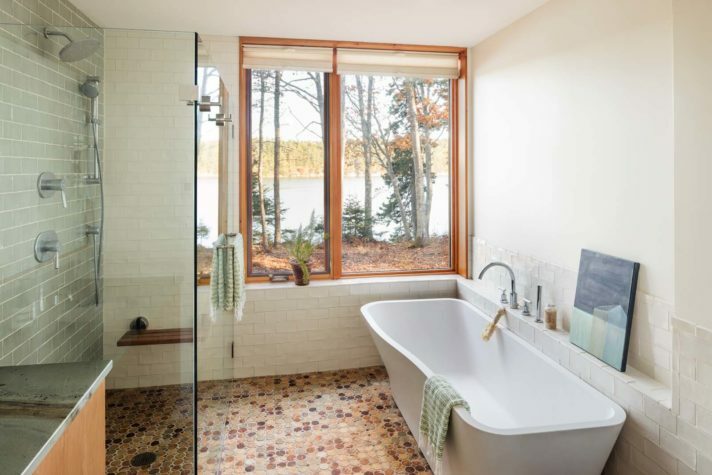 They didn’t want “cold modernism,” says Thompson, so the neutrals are white but also shades of brown, as with the Douglas fir in the trim and cabinetry and the hickory, cork, and hexagonal tile in the flooring. 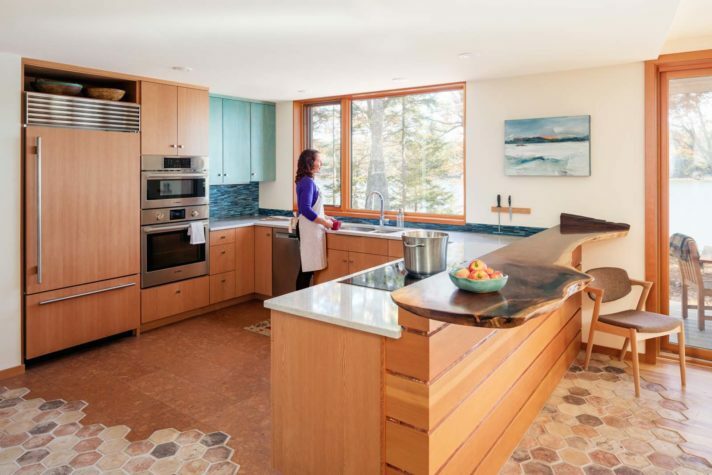 (In the kitchen, the tile was laid unevenly to mimic an advancing and retreating shoreline.) 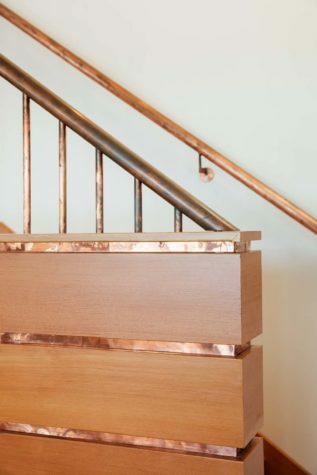 Further warmth is provided by the highly polished live-edge slabs of walnut used for the kitchen countertop and dining room sideboard surfaces, as well as the unusual choice of copper for detailing of partial walls, the stair handrail and balusters, and the interior of a vertical wood-storage bin. The latter forms part of a custom fireplace wall with Douglas fir shelving and flatpanel cabinetry, a hidden TV set, and a bluestone ledge for sitting. As for color: vibrant reds, chestnut browns, and teals show up in the living room furniture. Flat-paneled turquoise cabinets, on which one can still see the wood grain, are used as accents on the fireplace wall and mudroom built-ins. A darker blue tile surrounds the efficient Wittus woodstove, which, with the air-source heat pump, keeps the home warm. Since solar panels provide electricity, and the house is well insulated with triple-glazed windows and thermally broken double-stud wall construction, Thompson says the Dunns should never have to pay a utility bill. Despite interior design choices that already seem perfectly in tune with the architecture, the Dunns have not been in a rush to decorate. They want to make decisions deliberately, though they have already ensured plenty of sleeping surfaces for visitors. In addition to the guest rooms (one with a Murphy bed), three pieces of living room furniture convert into beds. The upstairs diner’s booth is also cleverly designed, so the table flips down to make a sleeping surface. 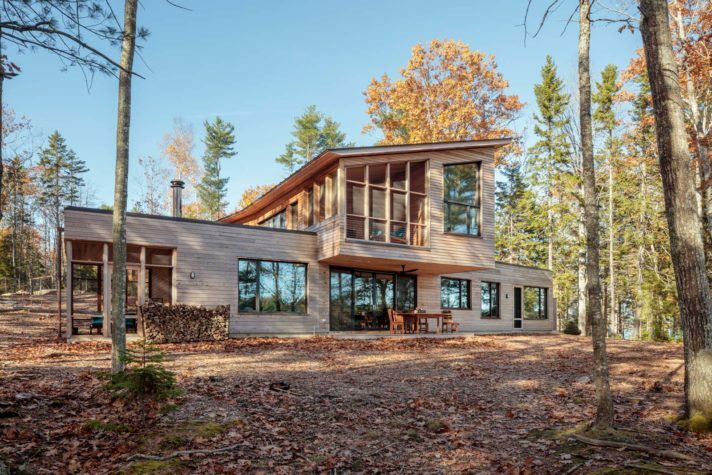 When the Dunns first approached Thompson and Dorsey, Sally says, she wanted the home to be about the water and for the structure to be “almost beside the point.” The vistas are, indeed, primary, and the exterior—nicely textured with red cedar siding laid as shingles or shiplap—blends beautifully into the landscape. Otherwise, though, the Dunns’ home is too remarkable for this particular wish to have been granted. But Sally Bliumis-Dunn might have unwittingly made another wish, one expressed not as a longing but simply as a description of something she admired. It’s a line from one of her own poems, written years before she and John even had their land. It expresses fascination with a wave, something that she describes as “lift(ing) away / as though / it kept wanting / to be held / in the empty / hands of air.” Just like the bridge over land, the pathway to the water, that is her home with John.